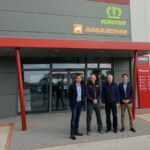 Farmhand, the exclusive Irish distributor for Krone, Amazone, Quicke, Zuidberg and APV have appointed Swaine Agri. In Rhode, Co.Offaly as a new main dealer. “Liam Swaine and his team have really impressed us with their commitment to after-sales and their new purpose-built premises” said Paul Scrivener, MD Farmhand. “Liam Swaine has been 20 years working in the farm machinery industry and prides himself in being service driven and customer focused” commented Paul. “We are delighted to be working with Farmhand. Our premises is nearing completion and we believe there is a big demand for Krone/ Amazone machinery in the area” said MD Liam Swaine.